February 3, the day before the beginning of spring (risshun 立春) according to the asian lunar calendar.
. The Twelfth Lunar Month　十二月 juunigatsu - in Edo - . toshiotoko, toshi otoko 年男（としおとこ）"man of the year"
toshionna, toshi onna 年女（としおんな）"woman of the year"
yaku otoko 役男（やくおとこ）"man to perform duties"
manriki otoko 万力男（まんりきおとこ）"man with a thousand strength"
iwai taroo 祝太郎（いわいたろう）"Taro for Rituals"
toshitori mame 年取豆（としとりまめ）"beans the number of the years of a person"
To be eaten by each, according to his/her age. mameuchi, mame uchi 豆打（まめうち）"throwing beans"
fuguri otoshi ふぐり落し（ふぐりおとし） "loosing something"
To leave behind the "old self", people would throw away a personal belonging, like a hairpin, on a crossroads to make it difficult for bad luck to follow them home after the shrine visit.
. Yakubarai - Amulets and Talismans from Japan . In with the Fortune, Out with the Devil! 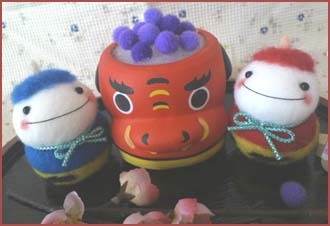 Setsubun on February 3 is the time to think about Demons. Oni wa soto, Fuku wa uchi ! Demons, out you go! Good Luck, please come in! On February 3rd of 2005, Setsubun will be celebrated throughout Japan. Falling at the end of the period defined by the solar principal term Daikan (Severe Cold), Setsubun occurs one day before the sectional term Risshun (Spring Begins). The setsu of Setsubun (literally "sectional separation") originally referred to the eve of any of the 24 divisions of the solar year (see The Lunar Calendar in Japan for an explanation of these divisions). However, the Setsubun associated with "Spring Begins" gained significance as a symbol of Toshi Koshi (year passing) or Jyo Jitsu (accepting the old year) by marking the completion of the cycle of the 24 divisions of the solar year. Only this Setsubun is still marked on the official calendar. 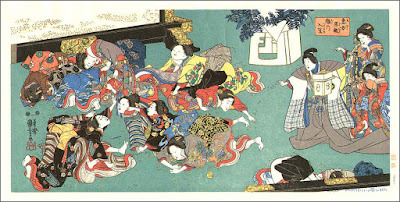 Setsubun achieved the status of an imperial event and further took on symbolic and ritual significance relative to its association with prospects for a "returning sun", associated climatic change, renewal of body and mind, expulsion of evil, symbolic rebirth, and preparation for the coming planting season. Customs surrounding this day apparently date as early as the Ming Dynasty in China, and in Japanese form, began to take shape in the Muromachi Era (1392-1573). Oni wa Soto; Fuku wa Uchi (Get out Ogre! Come in Happiness!). After the ritual throwing of the beans, family members may then pick up the number of beans corresponding to their age; eating these brings assurance of good fortune in the coming year. These days, of course, it is not uncommon to see children dressed in masks of oni, others madly throwing beans, and all gleefully shouting for evil to hit the road. 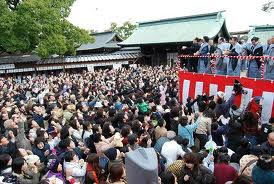 Prominent temples in Japan may also find monks or celebrities showering large crowds of people with mame to ward off spirits and welcome the renewal of the coming New Year. Read more about this Spring festival. Is is dried soy beans, pan-fried soy beans, or sugar-coated soy beans? Are they thrown in the house, or out the door? We throw them in both directions: in the house (Fuku wa uchi, luck come in) and out the door (Oni wa soto, Demons go out) . People born in the Year with this lunar animal sign will throw beans at famous temples and shrines. These people are called "Man of the year, toshi okoko" or "Woman of the year, toshi onna". Also in kindergardens and families, we throw beans. I did this event with my all family when my children were small. Do you eat the same number of beans as your age, or it your age + one beans? I eat as many beans as my age . That is the custom in my region. This custom dates back to the Muromachi Period. Setsubun is before the day of the first day of the Lunar New Year the evening , we will decorate sardine heads (iwashi) and holly leaves (hiiragi) in front of entrance. And is there, or is there not "a famous monk" (unnamed) associated with driving away "oni" by throwing beans? There is no famuse monk associated with Setubun. The event started during the Muromachi period on New Year Eve (old lunar calendar). At that period, contagious diseasees had spread in the capital of Kyoto (Miyako).
. WKD : the Color Red and Daruma .
. tsuina 追儺 "demon exorcism" . For an insignificant fee, he performs his little exorcism in any house to which he is called. This simply consists of the recitation of certain parts of a Buddhist kyō, or sutra, and the rattling of the shakujō. 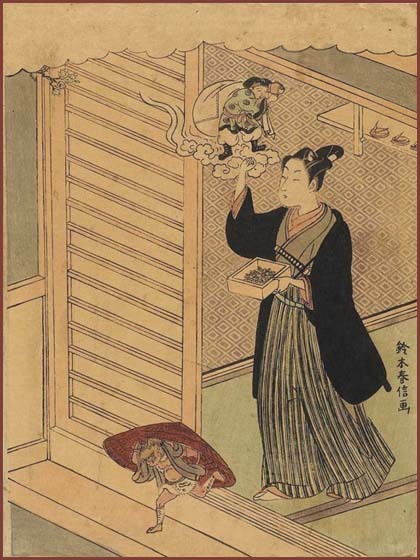 Afterwards, dried peas (shiro-mame) are thrown about the house in four directions. For some mysterious reason, devils do not like dried peas and flee. The scattered peas are later swept up and carefully preserved until the first clap of spring thunder is heard; when it is the custom to cook and eat some of them. But just why, I cannot find out. Neither can I discover the origin of the dislike by devils of dried peas. On the subject of this dislike, however, I confess my sympathy with devils. After the devils have been properly cast out, a small charm is placed above all the entrances of the building to keep them from coming back again. This consists of a little stick about the length and thickness of a skewer, a single holly leaf, and the head of a dried iwashi: a fish resembling a sardine. The stick is stuck through the middle of the holly leaf and the fish’s head is fastened into a split made in one end of the stick; the other end being slipped into some joint of the woodwork immediately above a door. Why the devils are afraid of the holly leaf and the fish’s head, nobody seems to know. Among the people, the origin of all these curious customs appears to be quite forgotten. The families of the upper classes who still maintain such customs, believe in the superstitions relating to the festival just as little as Englishmen today believe in the magical virtues of mistletoe or ivy. This ancient and merry annual custom of casting out devils has been, for generations, a source of inspiration to Japanese artists. It is only after a long acquaintance with popular customs and ideas, that the foreigner can learn to appreciate the delicious humor of many creations of art, which he may indeed wish to buy, just because they are so oddly attractive in themselves; however, which must really remain enigmas to them, so far as their inner meaning is concerned: unless he knows Japanese life. The other day, a friend gave me a little card case of perfumed leather. On one side was stamped in relief the face of a devil, through whose open mouth could be seen the laughing, chubby face of Otafuku, joyful Goddess of Good Luck, painted on the silk lining of the interior. In itself, the thing was very curious and pretty; but the real merit of its design was this comic symbolism of good wishes for the New Year: Oni wa soto! Fuku wa uchi.
. WKD : Oni, Japanese Demons . There is an expression in English, "no beans about it" which means that there is no problems. I wonder where this expression came from?I always associated it with chili (the food) in that in Texas it is believed that you ruin chili if you add beans. Boston, home of the "bean eaters," "home of the bean and the cod," may be behind the phrase. Walsh, in his Handbook of Literary Curiosities (1892), says that the American expression originated as a sly dig at Boston's pretensions to culture, a hint that Bostonians knew that Boston baked beans were good to eat, that they were made from small white "pea beans"--even if Bostonians knew nothing else. It may also be that the American phrase is a negative rendering of the British saying "he knows how many beans make five"--that is, he is no fool, he's well informed--an expression that probably originated in the days when children learned to count by using beans. But he doesn't know beans, "he don't know from nothing," possibly has a much simpler origin tha[n] either of these theories. It probably refers to the fact that beans are little things of no great worth, as in the expression "not worth a row (or hill) of beans." Another expression in my early Texas (through the South in general, and back to England between the time of William the Conqueror and Cromwell's taking over the government during the Protestant Revolution) family is, 'It doesn't amount to a hill of beans,' meaning something had been blown up out of proportion, when actually it was not important. Coming from an agrarian society, where beans grew prolifically and were cheap to plant, this had a lot of significance in everyday conversation.
. End of the Lunar Year and Setsubun .
. Yoshida Shrine 吉田神社, Yoshida jinja .
. Nagata Shrine in Kobe 長田神社 神戸 . This humorously bittersweet hokku, which seems to be based on memory, was written in the 11th month (December) of 1822, when Issa was recovering from a fall by staying at Yudanaka hot springs and at some students' houses. I think the hokku is about the astonishment everyone feels at one time or another at how deceptively simple life can sometimes appear. Issa evokes the last night of lunar winter, a night which usually falls in early February, soon before lunar New Year's. On this night either the owner of a house, the heir, or a man born in a certain year in the yin-yang zodiacal cycle would purify the house by walking around to all the rooms and shouting, "Good fortune in, demons out!" At the same time, he would throw parched soybeans at the invisible demons, thereby driving them out of the house. In some cases people played the role of visible demons, in which case the parched beans were thrown at them, causing them to escape outside. Even today, many people perform this ritual, usually in streamlined form. It's not clear which style of demon purification the hokku refers to, since the ritual has already finished. Issa's focus is on sweeping up all the beans left on the floor and on the ground just outside the house and also, perhaps, on picking up hastily abandoned demon masks and costumes. When he finishes cleaning (together with his wife? ), he can finally relax and sits in an informal, cross-legged way on the floor in sharp contrast to the stiff, formal way the ritual was performed. Although Issa performs the ritual as a social custom, he almost surely does not think there were actually demons in his house until just a few minutes earlier, and as he now sits doing nothing he may well feel the pathos of the ritual and wish it could actually be what it claims to be. If life were that simple and avoiding problems that easy, his life until then -- and the lives of most people -- would have been very happy. In retrospect, the hokku seems almost ironic, since the next year was perhaps the most difficult year in Issa's life, with his wife dying in the fifth month and his young son Konzaburo dying in the twelfth month. risshun, beginning of spring [one of the 24 Seasonal Essences (fortnightly periods); the next day after Setsubun, February 2 or 3.
. SPRING - HARU . ***** Setsubun-Soo, setsubunsoo 節分草 "Setsubun plant"
By Ryokan (1757-1831), from "Selected Tanka,"
In the traditional Japanese hana kotoba (language of flowers), the icy-white blooms of the setsubun-so mean "I want to be alone," and, in their austere simplicity, we can see a reflection of the life of the renowned Zen hermit Ryokan. These plants bloom amid the retreating snow, around the time of the festival of setsubun (changing-of-the-season day), and so they were named setsubun-so, literally "setsubun flowers." According to the ancient lunar calendar in use in Japan until Jan. 1, 1873 (when the Gregorian calendar replaced it), the third day of the second month marks the departure of winter. So spring is in the air! Despite its delicate appearance, Shibateranthis pinnatifida is a tough alpine plant adapted to growing in woodlands and chalky ravines. It is a member of the buttercup family, which includes anemones and monkshood, and it has the attractive, deeply cut leaves typical of the group. Its papery "petals" are really sepals: The actual flowers are tiny yellow dots clustered around the dark pink stamens in the center. Unfortunately, this lovely plant is now an endangered species in Japan, but numbers of the flowers are still found in Hiroshima Prefecture. In Tokyo, you can see them flowering from mid-February at the Jindai Botanical Garden in Chofu City, and at the Mukojima Hyakka-en in Sumida Ward. While the priest reads the sutras in a loud voice, 15 red and green demons performed by boys of 15 years wearing the old masks, run around with spears and swords to ward off evil and bring in good luck for the families. This ritual has been going on since the Nara period and people like to take part in it. "Fuku wa uchi! Oni wa uchi! Akuma soto!" The town of Mizunami 瑞浪市 in Gifu is also famous for its "Demon Rock", Oni Iwa 鬼岩. And a Setsubun festival where the demons are called into the home to bring good luck. In Mizunami , they say " Oni wa uchi　鬼は内　Fuku wa uchi 福は内".
. kesoobumi uri 懸想文売 vendor of love letters .
. onigiri　oni おにぎり鬼　Onigiri demons . Ambling past a row of temples the other day, I found myself in front of a shop selling traditional Japanese sweets. A sheet of paper taped to the glass door advertised uguisumochi--a Japanese confection made of sweet rice paste coated with pale green soybean powder. The dainty sweetmeats were arranged neatly on a shelf. "The softness of an uguisumochi/ Becomes pleasantly heavy in my hand." On the sloped road past the shop, a signboard said: "Setsubun Festival, Feb. 3. Mamemaki (bean-scattering ceremony) at 3 p.m." The Setsubun good-luck festival is held in early February each year, one day before the start of spring according to the lunar calendar. Novelist Mori Ogai (1862-1922) described his experience on one Setsubun day during the Meiji Era (1868-1912) in his novella titled "Tsuina." Ogai was waiting for his dinner partner in a private room at a ritzy ryotei restaurant when an elderly woman in a red vest barged in. After a brief greeting, she began throwing roasted soybeans, chanting the traditional Setsubun refrain of "Oni wa soto, fuku wa uchi" (Demons out, good luck in). Then a few women came into the room and gathered the beans scattered on the floor. Indeed, people shouting at the tops of their lungs and throwing beans with abandon is a heartwarming scene on Setsubun day. These days, your neighbors may not like the noise you make on Setsubun day, but I think you can be forgiven. It is after all a special day, and you are driving away evil spirits. The chant varies from place to place. At Osu Kannon Temple in Nagoya, whose treasures include a mask of an oni, or demon, celebrants shout only "Fuku wa uchi." At Tokyo's Inari Kiojinja, the chant goes "Fuku wa uchi, oni wa uchi" in part because the written name of the shrine contains the Chinese character for oni. Yet, at Iriyakishimojin Shrine in Tokyo's Iriya district, the word oni is replaced with akuma (devil) because this shrine also uses the oni character in its name. Lately, some bean-scattering ceremonies have become big spectacles, a form of entertainment event. 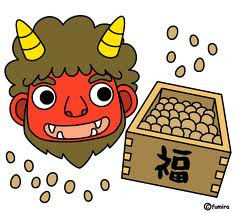 Still, I think the real spirit of Setsubun is best preserved in simple bean-scattering ceremonies at home or wherever one happens to be, with celebrants thinking their own thoughts about good luck and demons. Of each patient in hospital." 鈴の宮蜂田神社 Hachida Shrine "for clay bells"
There was a special shrine ritual for that day, 鈴占神事. This ritual is more than 1000 years old. A person called Hachida Ren 峰田連 had made 12 clay bells and offered them to the shrine in Spring. When the priest rang the bells, they would foretell the outcome of this years harvest and good fortune from the sound of it. 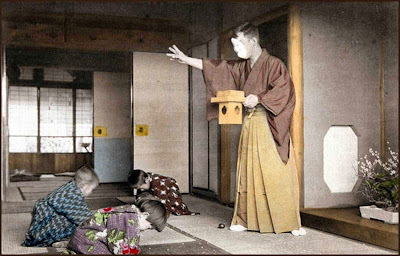 This ritual had almost died out, but been revived in the Meiji period. The used bells were buried in a sacred mound in the shrine compound, but this has been stopped in 1929 and the bells have been sold to visitors on the day of Setsubun. At the district 一之貝地区 Ichinokai a tale is told at Setsubun. On the Setsubun Day (now February 3) Watanabe no Tsuna had cut off the arm of Shuten Doji. So the villagers with the name 渡辺 Watanabe are not afraid of this yokai. Together with the villagers named Ibaraki these families do not have to throw beans for driving away the oni. In the 軽井沢地区 Karuizawa district there are only 50 families, and 34 of them have the name 茨木性 Ibaraki. There is a pond called 茨木清水 Ibaraki Kiyomizu where Shuten Doji and Ibaraki Doji had a sumo wrestling match. After that, Ibaraki Doji stayed in the area and founded this village. His descendants live live in simple farm houses and if they try to build a stronger roof and gate, the family will be punished with bad luck - or so they say. On the evening of Setsubun the 出雲に鬼 demons of Izumo come out. The God of Izumo sits on his bronze horse and drives them away with his bow and arrow. On this day the people of Izumo do not go outside to see him. Once a curious old hag peeked out from a small hole, but the Deity saw her and hit her eye with his arrow. The most common custom is the traditional mamemaki　豆まき　/ 豆撒き, the throwing of beans (mame) to chase away the evil Oni (demons, ogres, evil spirits). Grains have a great vital power and were thought to 魔除け ward off evil influence. The word MAME (beans) was originally written 魔滅 to wipe out demons. To make sure the beans would never grow again, they had to be roasted 炒った豆 before throwing them at the demons. Mamemaki started at Mount Kurama in Kyoto.
. Kurama no oni taiji 鞍馬の鬼退治 driving out Oni at Kurama . 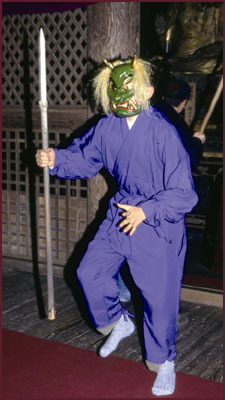 For Setsubun, there are usually two demons, Aka-Oni 赤鬼 Red Demon and Ao-Oni 青鬼 Blue/Green Demon. They have two horns and two eyes. where the Oni are welcomed into the home - for various reasons. oni wa uchi 鬼は内 Demons come in! (Good luck come in and) Demons also come in!
. Onibabari 鬼払い driving out the demons . The red Oni symbolizes greed, the green Oni anger and the black Oni stupidity.